We’re now at Concert 2 in the annual Cerne Abbas Music Festival in Dorset, a feast of known and unknown chamber music, and a showcase for the Gaudier Ensemble, whose 24th festival it is. 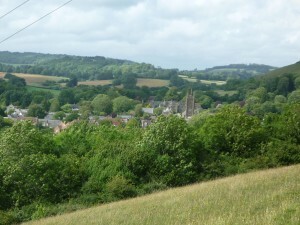 As time has gone by, and the players have moved further and further afield and acquired jobs, professorships, concert careers and families, it seems more and more of a miracle that we manage to get together each summer in this picturesque Dorset village for another joyful, not to say headlong, plunge into the fire of chamber masterpieces. For the last six days the players have followed an intense rehearsal schedule, often tackling very complex pieces of music on just a few hours of work. Of course this can only succeed with players of great skill and experience, as they all are. When I’m not rehearsing, I sometimes listen to other people’s rehearsals. Although this may seem a blindingly obvious thing to say, it often strikes me that the performance of any of these pieces depends on having musicians with advanced instrumental skill. That didn’t used to strike me as anything so remarkable, but now it does. We’re all aware that the opportunity to learn an instrument to this level isn’t available to everyone, and sometimes isn’t taken up even when it’s offered, or isn’t taken up for long. But if the instrumental skill isn’t there, these wonderful pieces won’t be able to be performed. Instrumental mastery is the means by which the music is able to live. If the skill dies out, the music will be silent, except on record, and that’s a whole different thing, a sterile thing compared with the magic of live performance. So I often find myself watching players of extraordinary skill, and being more aware than I used to be of how precious this skill is. This entry was posted on Friday 13th June 2014 at 7:32pm	and is filed under Concerts, Musings, Travel. You can leave a response, or trackback from your own site.